لگزی, پریسا, خانمحمدی, محمدعلی. (1393). روش قرائت و ثبت مظاهر منظر فرهنگی. مجله علمی-ترویجی منظر, 6(26), 24-29. پریسا لگزی; محمدعلی خانمحمدی. "روش قرائت و ثبت مظاهر منظر فرهنگی". 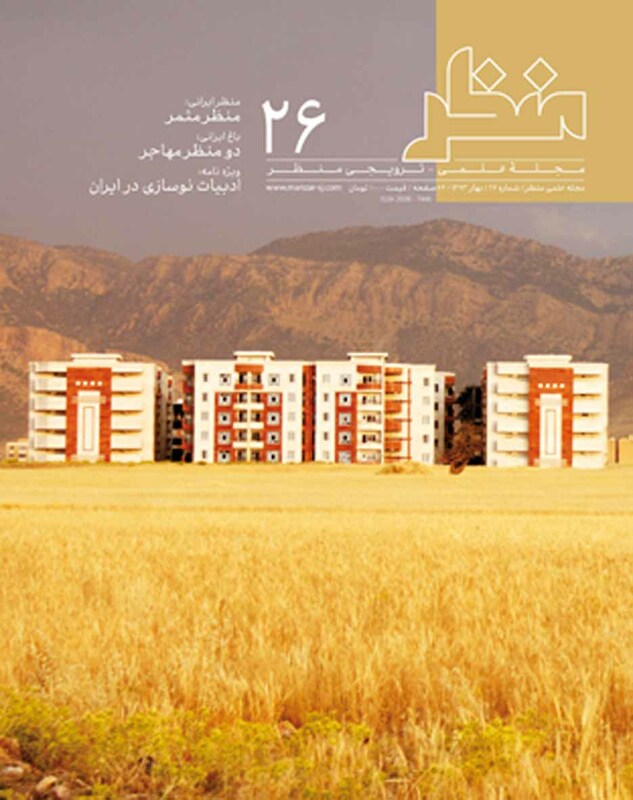 مجله علمی-ترویجی منظر, 6, 26, 1393, 24-29. لگزی, پریسا, خانمحمدی, محمدعلی. (1393). 'روش قرائت و ثبت مظاهر منظر فرهنگی', مجله علمی-ترویجی منظر, 6(26), pp. 24-29. لگزی, پریسا, خانمحمدی, محمدعلی. روش قرائت و ثبت مظاهر منظر فرهنگی. مجله علمی-ترویجی منظر, 1393; 6(26): 24-29. در روند ارزیابی و بررسی ارزش‌های اجتماعی ـ فرهنگی اکوسیستم‌ها‌، شکاف‌های روش‌شناختی عمیقی در حوزه مباحث مفهومی مرتبط با ارزش‌های زیباشناسانه، معنوی یا تاریخی آشکار می‌شود. این مقاله با این فرض که بهره‌برداری از منافع غیرعینی اکوسیستم‌ها ـ که خدمات فرهنگی اکوسیستم یا به اختصار CES1 نامیده می‌شوند ‌ـ آثار ملموسی بر منظر فیزیکی به جا می‌گذارد، رویکرد جدیدی را جهت شناخت این منافع ارایه می‌دهد. این پژوهش نمودهای عینی به جا مانده از کاربرد CES در منظر را در قالب یک تحلیل میدانی از یک سایت ردیابی و ثبت می‌کند، سپس آنها را کمی کرده و با ابزارهای بصری ـ فضایی مثل نقشه یا GIS تحلیل می‌کند. نتایج این تحقیق، اطلاعاتی را در خصوص ویژگی‌ها، مفاهیم و نحوه توزیع فضایی CES ارائه می‌دهد و امکان تحلیل آنها را نیز از لحاظ تعامل با ویژگی‌های منظر یا مجموعه خدمات اکوسیستم فراهم می‌کند. این نتایج همچنین دو مزیت عمده این روش را نشان می‌دهد : 1) به عنوان رویکردی برای تجزیه و تحلیل آماری و ادغام با داده‌های کمی و فضایی در ارزیابی جامع منظر مناسب است. 2) به عنوان نسخه‌ای ساده شده می‌تواند داده‌های ارزشمندی را برای کاربردهای تحقیقی یا مکمل تولید کند. Recording and scanning method of cultural landscape manifestations. 1M.A in Architecture, Science and Technology University, Iran. 2Ph.D in Architecture, Assistant Professor, Science and technology University, Iran. Ecosystem services has been defined as ‘‘the benefits people obtain from ecosystems” by MA, the Millennium Ecosystem Assessment. Some of these benefits are non-material which according to the MA definition, are obtained through ‘‘spiritual enrichment, cognitive development, reflection, recreation, and aesthetic experiences. These benefits are called cultural ecosystem services (CES) and include six subsets: Cultural identity, Heritage values, Spiritual services, Inspiration, Aesthetic appreciation, and Recreation and tourism. There is a strong linkage between CES and the determinants and constituents of human well-being, which made it important to recognize and analyze them. Attempts at assessing the values people attach to ecosystems reveal profound methodological gaps regarding the non-material domains associated with aesthetic, spiritual or heritage values. The methodological backbone of CES assessments is the conducting of qualitative interviews. But interviews for analyzing CES are necessarily intensive and in-depth; thus they can hardly be conducted using quantitative, standardized questionnaires. Data on other ecosystem services are mainly quantitative and therefore this makes it difficult to integrate study results into comprehensive reports on different types of ecosystem services. Data generated through typical interview techniques which do not integrate maps or photos into the process do not deliver spatially explicit data, making it hard to relate non-material values to a specific place or feature of the physical landscape. This paper presents a new approach for trying to grasp these intangible benefits based on the assumption that making use of CES leaves discernible marks on the physical landscape. We explore the potential for tracing visible manifestations of CES in a field walk-based landscape analysis in the district of Unterlenningen, the Swabian Alb in southwestern Germany. The general structure of this approach is to systematically record these manifestations of CES in the site, to quantify them using statistical methods and to integrate them into spatially explicit representations such as map or GIS. The results provide information on the character, significance, and spatial distribution of CES and allow for analysis in terms of correlations with landscape features or ecosystem services bundles. Based on our results, the method has two main strengths: 1) as an approach it is suitable for statistical analysis and integration with spatially explicit and quantitative data in comprehensive landscape assessment; and 2) as a simplified version it can generate valuable data for exploratory or complementary uses. However it has several limitations. Most importantly, not all types of CES can be captured adequately with this method; moreover, spatially explicit and quantitative data are provided only to a limited degree. Therefore, we see the benefits of this method mainly as a complement to other approaches, such as interviews with individuals, focus groups, and literature reviews. In this regard, the method of recording visible manifestations can be an important component of the multi-faceted toolbox which is indispensable for assessment of CES. Future application of the method may take two primary directions. First, it can be applied in a strictly systematic way, providing quantitative data suitable for all kinds of statistical analyses. Second, it is a simplified version of the method. A relatively rough quantification and spatial exemplification is needed in order to provide an overview of CES provisions or to derive exploratory insights of single CES types when comparing different investigation areas.